After four-straight state tournament appearances spanning from 2005-2008 -- including two Class 1A championships in 2006 and 2008 -- St. Thomas Academy found itself in the midst of another streak. Despite top rankings in Class 1A and the top seeding in Section 4A, the Cadets failed to reach the state tournament in 2009 and 2010. 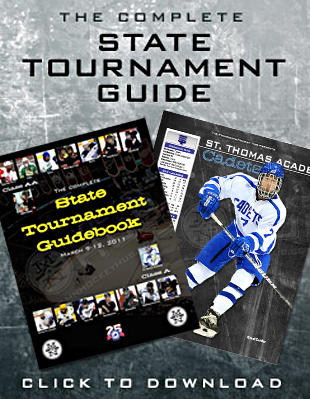 St. Thomas Academy ended its two-year tournament drought with a 5-3 victory over Totino-Grace. For the past two years, the Cadets’ season preview included the words “hungry” and “ravenous”. Senior forward Zach Schroeder had a different phrase. “We were dedicated to get back and I’m really excited,” Schroeder said. Though many thought St. Thomas Academy would suffer from graduation, this year’s upperclassmen have led a talented Cadets team to its fifth state tournament appearance in six years. “I’ve been there once before and it’s the greatest feeling in the world,” St. Thomas Academy senior forward A.J. Reid said. Schroeder (24-33-57) centers the Cadets’ top line featuring Reid (24-32-56) and fellow senior Matt Kroska (25-24-49) that fuels an electric offense including juniors Andrew Commers (17-13-30) and Peter Krieger (8-24-32) as well as sophomore Alex Johnson (12-15-27). 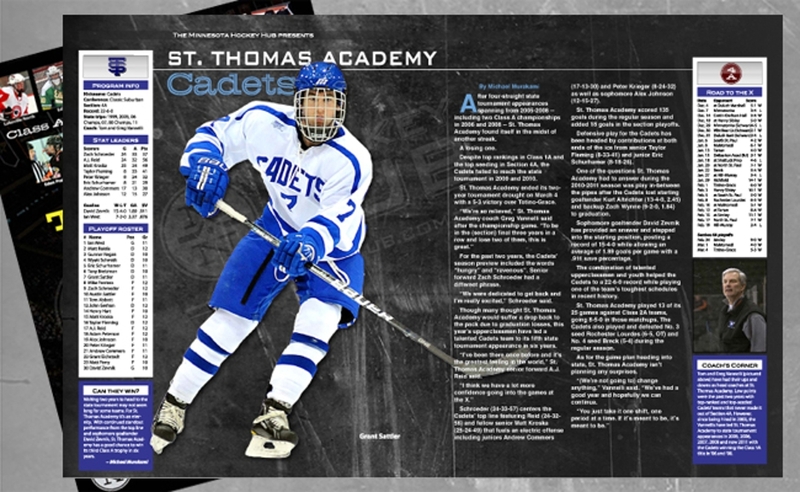 St. Thomas Academy scored 135 goals during the regular season and added 18 goals in the section playoffs. Defensive play for the Cadets has been headed by contributions at both ends of the ice from senior Taylor Fleming (8-33-41) and junior Eric Schurhamer (8-18-26). One of the questions St. Thomas Academy had to answer during the 2010-2011 season was play in-between the pipes after the Cadets lost starting goaltender Kurt Altrichter (13-4-0, 2.45) and backup Zach Wynne (9-2-0, 1.84) to graduation. Sophomore goaltender David Zevnik has provided an answer and stepped into the starting position, posting a record of 15-4-0 while allowing an average of 1.89 goals per game with a .911 save percentage. The combination of talented upperclassmen and youth helped the Cadets to a 22-6-0 record in one of the toughest schedule in the team's recent history. 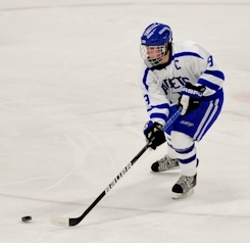 St. Thomas Academy played 13 of its 25 games against Class 2A teams, going 8-5-0 in those matchups. The Cadets also played and defeated No. 3 seed Rochester Lourdes (6-5, OT) and No. 4 seed Breck (5-4) during the regular season. 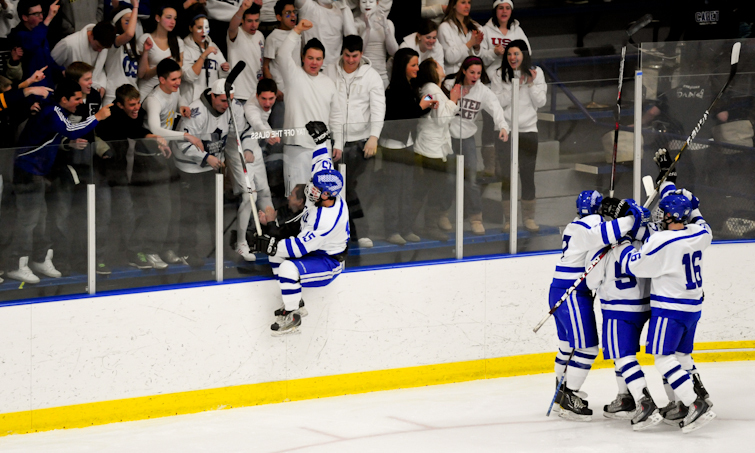 As for the game plan heading into state, St. Thomas Academy isn’t planning any surprises. “(We’re not going to) change anything,” Vannelli said. “We’ve had a good year and hopefully we can continue. Waiting two years to head to the state tournament may not seem long for some teams. For St. Thomas Academy it’s an eternity. With continued standout performance from the top line and sophomore goaltender David Zevnik, St. Thomas Academy has a good chance to win its third Class 1A trophy in six years. Tom and Greg Vannelli have had their ups and downs as head coaches at St. Thomas Academy. Low points were the past two years with top-ranked and top-seeded Cadets’ teams that never made it out of Section 4A. However, since being hired in 2003, the Vannellis have led St. Thomas Academy to state tournament appearances in 2005, 2006, 2007, 2008 and now 2011 with the Cadets winning the Class 1A title in ‘06 and ’08. For a private school team and perennial 1A contender, having a bull’s-eye on its back comes with the territory for St. Thomas Academy. In each of the previous two Section 4A finals though, that target took a direct hit courtesy of underdog Mahtomedi. This year for the Cadets, though, being victimized by any sort of three-peat in the section playoffs — whether at the hands of the Zephyrs in the section semifinals or Totino-Grace in the championship — was not on the agenda. Whatever pressure Vannelli felt before the Totino-Grace game must have been amplified tenfold in the third period, which began with the score tied 2-2 and ended with a four-goal flurry in the final seven minutes. When the ice shavings had settled, though, the Cadets had won 5-3. They enter Wednesday’s Class 1A quarterfinal game against New Ulm as the tournament’s No. 1 seed. Reid and Schroeder led the way offensively, combining for five points in the section final, but the play of sophomore goalie David Zevnik was the story of the tournament — and arguably the year — for STA. Now Schroeder and Reid are the stars, and they have one last shot at a title run.